Completed model depicting US Army Bu #00234 debut airframe. Model photographed on custom display base and background. The majority of the models we make resin accessories for are for modern jet aircraft. After all, they're my personal favourite subjects. I have a lot of ideas for the jet models in my huge stash in the way of upcoming resin sets. But, that in no way means I don't have a affinity for the modern military marvels that are attack choppers. I think they're all awesome! Whether they're helicopters originating from the U.S., NATO, Russia, or wherever the country of origin; like our logo tag implies; if its modern military aircraft, were a fan. So, in the spirit of scale modelling and inspiration for my fellow 1/72nd scale modellers out there, I wanted to share a few photos and talk about of one of our display models. My supply of bits and pieces for scratch-building, organized in their own plastic baggies for detailing model kits and creating our resin accessories. 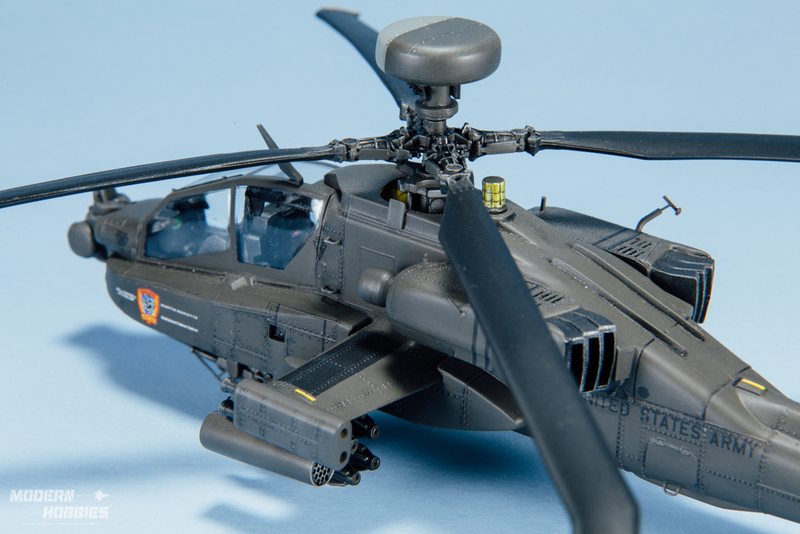 I looked over at the display shelf and grabbed the first helicopter that caught my eye..Italeri's 1/72 scale AH-64D Apache. I'll forgo on a history lesson, as fellow modellers, you guys are all too familiar with this formidable war machine. I built the model primarily straight from the box, however I added details here and there to enhance its appearance and to improve accuracy. 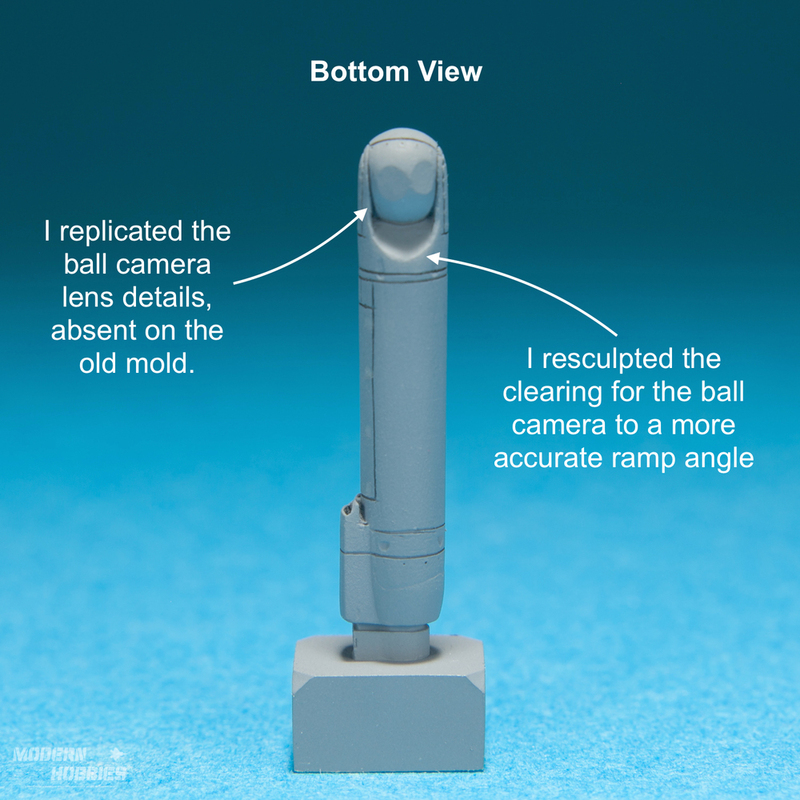 Out of the box, the models over-all appearance and features is accurate. 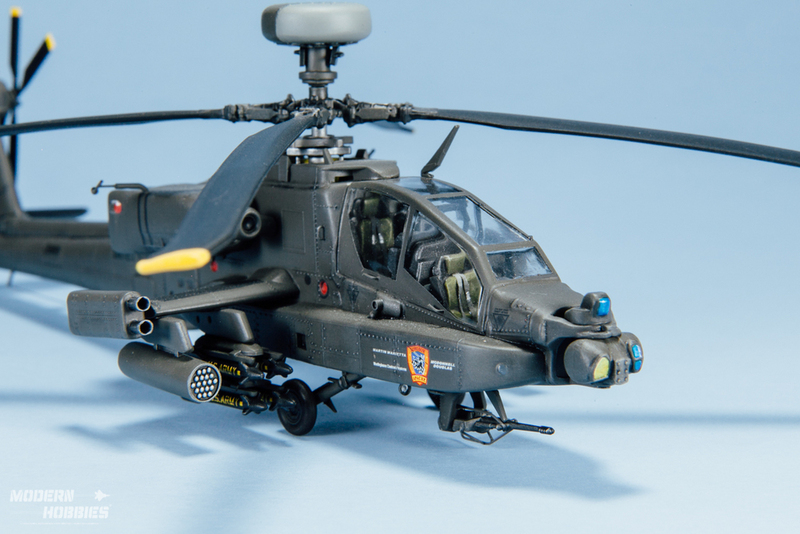 Italeri did a good job of establishing the look of the updated Apache Longbow featuring it's AN/APG-78 Fire-Control & Targeting Radar above the mast and rotors. Another standout feature of the Longbow done well by Italeri are the forward fuselage expanded avionics banks. Details I wanted to add that appear on the real machine that were not depicted in the kit were various grab handles and antenna wires. 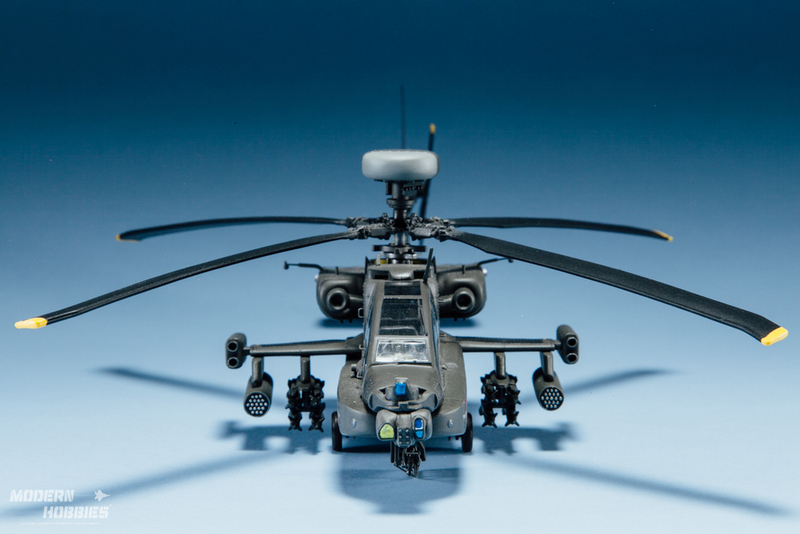 I also wanted to scratch-make the cage around the Apache's 30mm M230 chain gun. For scratchbuiding details, I keep a supply of bits and pieces of styrene, sprue from old builds, thin cooper wire, etc. I keep things organized in individual plastic baggies to make it easier to find bits I need for detailing. To begin, I select a piece of old model kit sprue approx. 2-1/2 inch. in length. 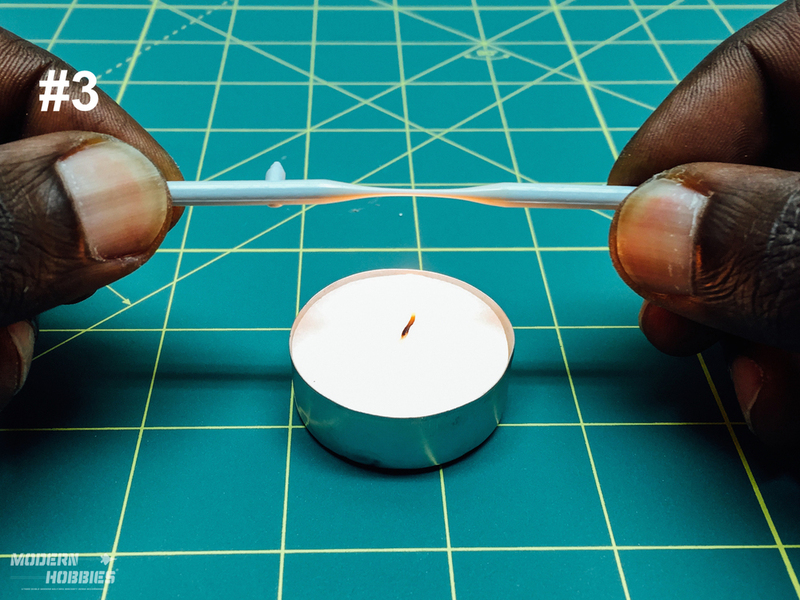 I hold the sprue over a candle flame and slowly rotate it to soften the plastic. 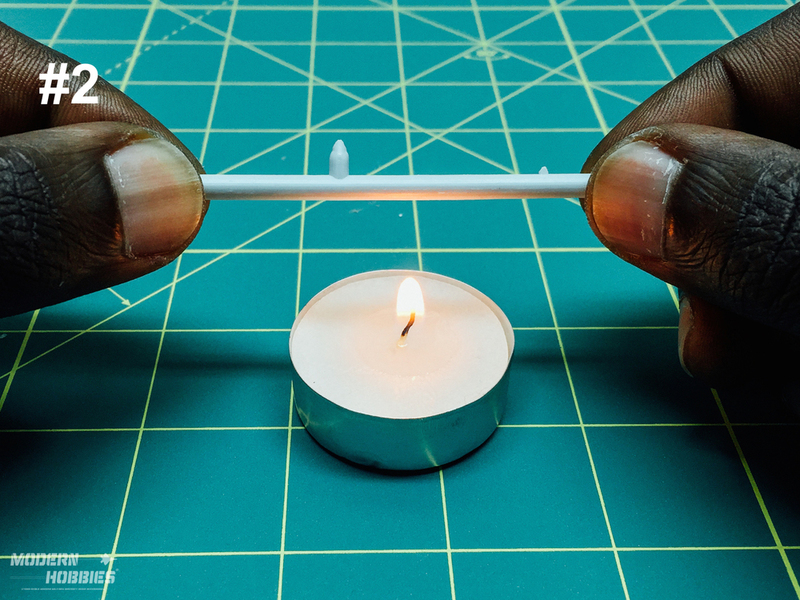 Be careful not to hold the plastic directly in the flame to avoid it catching fire. 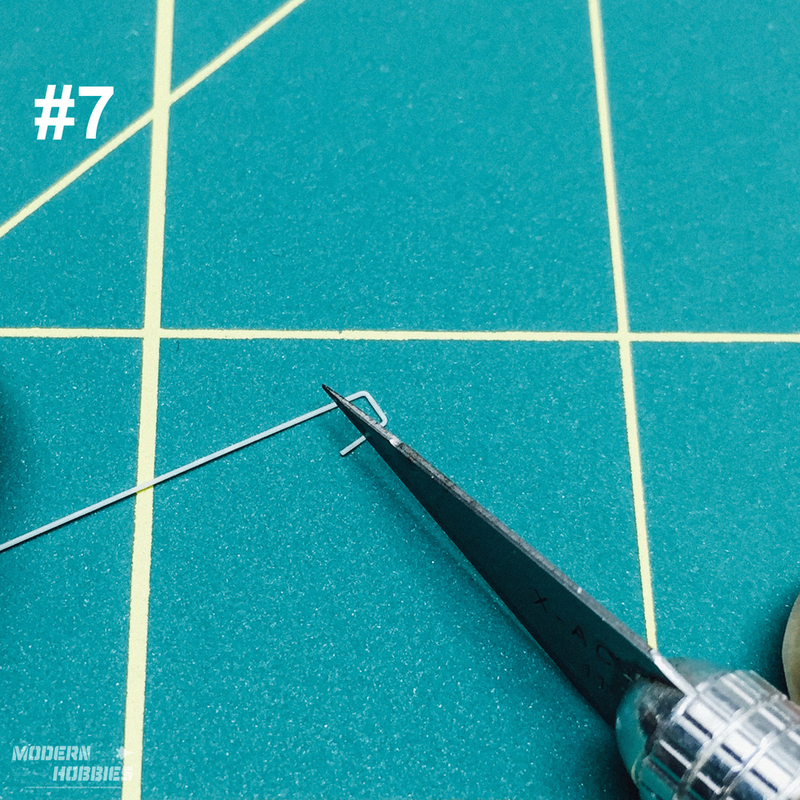 After slowly stretching the rod, it's possible to create a very long thin wire of styrene. I then chop the long strand into smaller strips to begin fashioning the grab handles for the Apache. Bend the tiny strand ends in 90 degree angles forming a "U" shape. Check shape with your references. Now cut away the excess plastic ends..
And .."Presto!" Your grab handles are made. I checked the tiny handles for scale against my trusty 1/72 Col. Robin Olds figure. I prepare the model by removing the molded-in grab handles with a sharp chisel-tip knife tool and sanded the area smooth. Finally, I attached our scratch-made grab handles with a tiny dot of Tamiya Extra Thin liquid cement. Click on the photos below to have a closer look. Well, I hope you all found this useful for your own 1/72 scale modern military aircraft! Like I mentioned, "Its not just jets." As you can see, you can do a lot with just a versatile technique like heat-stretched sprue to add much needed details not present straight out of the box. I hope this inspires you to try your hand at the technique and more scratch-building. Keep the radar on! Cheers. New E-book | Now available! Click her to take a closer look and order your digital copy! It's been a busy few months around the workshop here at Modern Hobbies. 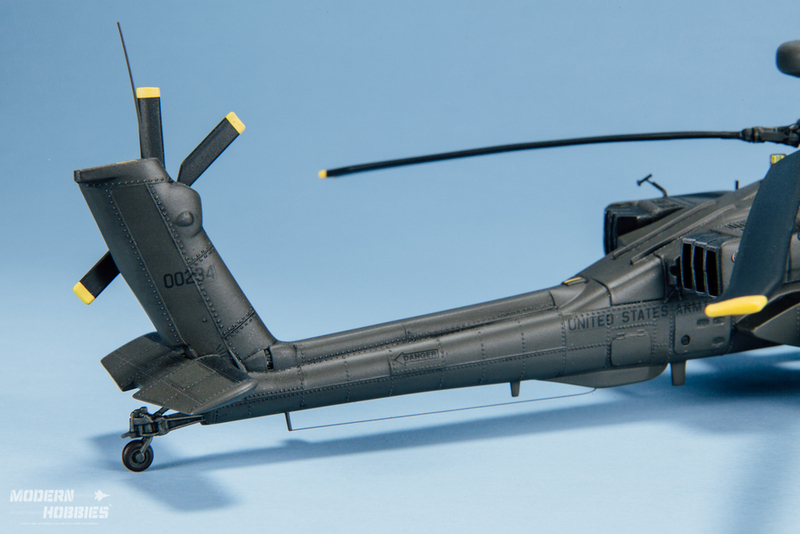 In addition to steady orders, I've been writing like crazy and have just completed our first e-book under a new recurring series: Building and Finishing 1/72 Scale Modern Military Aircraft. Our first title "Tomcat to "Flir-Cat" takes modelers of basic, and intermediate skill levels step-by-step on a complete build, conversion and finishing of Italeri's F-14 "Bombcat" kit into VF-103 "Flir-Cat". In the e-book, we'll cover tips, techniques and personal secret methods I use to build 1/72nd scale modern aircraft that has earned several IPMS Regional 1st place awards. From kit preparation, preliminary painting, detailing tips and techniques, finishing skills, airbrushing and more. The complete e-book will consist of 9 chapters, 52 pages with over 200 high-resolution colour photos throughout in PDF format. It's now available directly from Modern Hobbies as a digital download for just $8.99. To order by credit card navigate to the regular Shop page or with PayPal, navigate to the PayPal Ordering page. I can't wait till you all get your your copy! Modern Hobbies | Mobile Ready! Modern Hobbies' ranking is high, showing up as the first serval results after just typing "modern hobbies". Awesome. Several months ago Google announced its plans to configure it's search ranking features for web sites to be optimized for mobile devices. For decades web stores like Modern Hobbies and thousands of others have enjoyed strong web search rankings via desktop web search, shopping, and browsing. Google is changing with the times and so have Modern Hobbies. You'll be pleased to know that we have built our web store with Squarespace, whose web builder software is optimized for mobile devices such as smart phones & tablets as well as desktop computers using PC or Macs. So you all, our customers can rest assured that you'll continue to "find" MH while searching, browsing our web-store as our Google ranking is high. So there you have it. Feel free to stop by Modern Hobbies on your mobile device while your out and about. Weather you're getting coffee, lunch time break, or at your workbench. Thanks in large part to all my customers and interested fans. Thank you! Modern Hobbies is mobile ready. Cheers! Well, it's that time of year when I step away from the shop for our family vacation and a little fun in the sun! I have to celebrate a birthday in there as well! The shop will be closed until I return on March 27, 2015 and I will resume fulfilling new orders as normal. *Orders placed before Sunday March 15th are being completed and are on schedule for parcel delivery. I should also have more of a timeline when I'll re-launch the AIM-9X, AIM-9L and AIM-120(C) as well. Also the votes are in regarding the upcoming F/A-18 Super Hornet cockpit. The votes where 2 to 1 for the "F" two-seater version as our starting set. The single-seat "E" will follow immediately after. 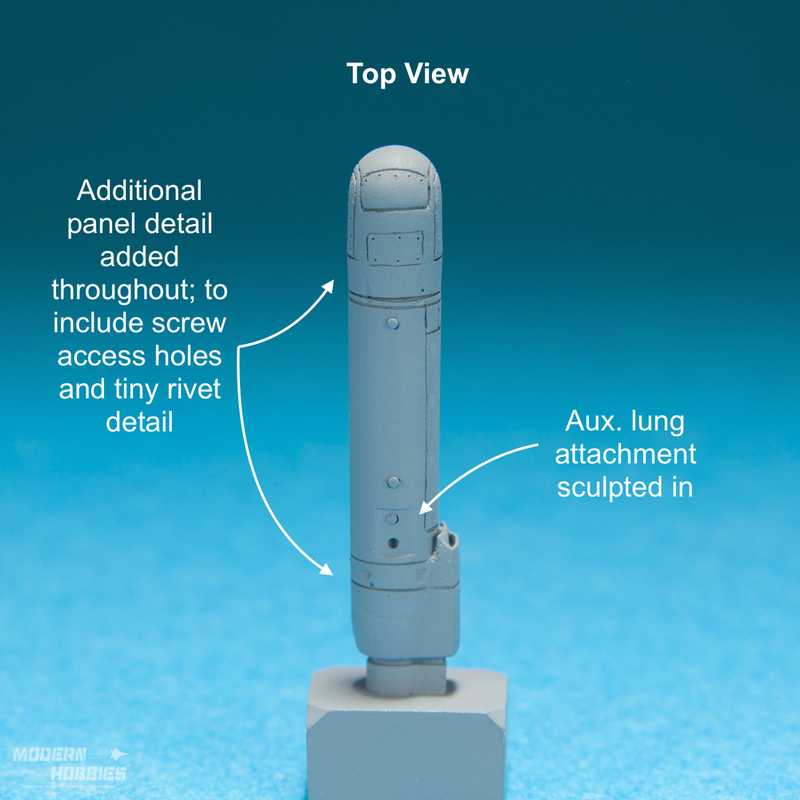 The cockpit set will be mastered for the Hasegawa kits. All research is done, references are at the ready and I've already begun! I'll post photos of my progress so you can all see how it's coming together. Well, thats it for now. I'll have a drink for you all while I'm on holidays! Chat soon! Just before the holidays, I received an email from a customer and fellow modeller Jason Liang about his order. 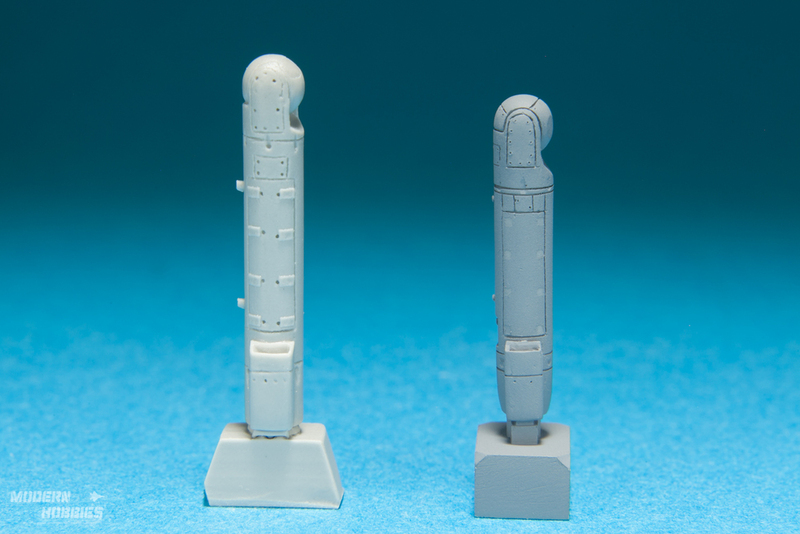 He was generally pleased with his items, but noticed some inaccuracies with our 1/72 AN/AAQ-28(v) LITENING Pod. The LITENING Pod was one of handful of resin accessories in our product line way back in 2007. When I created the master for it, I have to admit that it was a challenge due to the lack of adequate references. As a result, some inaccuracies in dimensions and details where inadvertently created. I have to be honest, and I'm not ashamed to say, I was a bit embarrassed. However, I'm grateful for Jason's email, because It's an opportunity to re-visit, re-evaluate and improve the product! Fast-forward now 8 years; references are plenty online and in print, and more detailed now that the LITENING Pod has been in service with International airforces for over 16 years. Figure #1 After transferring the actual length to paper represented by the drawn line I could clearly see the error in length. From here I can now figure the correction using my 1/:72 Scale Ruler and trusty caliper tools. The actual AN/AAQ-28(v) LITENING Pod measures 87inch. long or (7.25ft.) Converting it down to 1/72 scale using my 1:72 Scale Ruler, that is approx. 1-7/32in or (31mm) when checked with my caliper tool. My early Litening Pod was too long at 35mm..yikes! See (Figure #1) I corrected this by cutting the 4mm difference from the pod. I reattached the pod with superglue and sanded it smooth, including all detail for a clean canvas. The diameter of the actual Litening Pod is 16in or 0.046 meters. After checking this against my pod; it looked about right so I moved on to other areas that need attention. Figure #2 A big difference in over-all appearance in the air-intake and inlet. I then went to work on the re-scribing all the panels. Relying heavily on the new reference photos, I re-scribed the main panel that house the internal electronic boxes, screw holes and panels that indicate sections of the pod. I also improved the appearance of the ball camera sensor windows, now more accurately depicting the small circle windows in a deployed configuration. After much work with micro saws and scribing tools, I finished things by adding all appropriate rivet details. Finally, a primed the pod and mounted to its new casting block in preparation for a master mould. Check out additional photos below to compare the old with the new MH Litening Pod. I'm just finishing up minor touches, making the production moulds and the re-mastered Litening Pod will be back in the MH inventory and ready for new orders in the next several days. Don't look now but I think 1/72 Col. Robin Olds likes it. *For those of you out there who have recently purchased the old Litening Pod, you will be able get a replacement copy for free when I announce availability. You will just need to contact Modern Hobbies from the website or by email with your prior order number or PayPal invoice number. I'll send you an invoice for shipping only and thats it!